Teachers’ perceptions of the impact of the internet are fairly consistent across the full sample, yet some small differences emerge across subgroups. For example, older teachers and those teaching in rural areas are slightly more likely than others to see the overall impact as mostly positive (see table below). Likewise, middle school teachers (those teaching grades 6-8) are slightly more likely than high school teachers to describe the impact as mostly positive, as are math teachers relative to those teaching other subjects. Conversely, teachers in large urban centers and metropolitan areas and those who describe their students as coming from mostly lower income households or living below the poverty line are slightly more likely than those teaching in most other community types to say the impact of the internet on student research skills has been mostly negative. 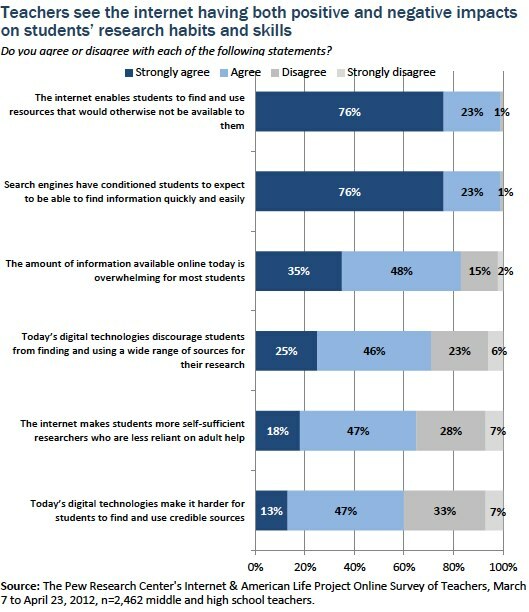 While on the whole the teachers surveyed see “mostly positive” impacts when it comes to how the internet is shaping the way their students conduct research, the teachers’ responses to a series of assertions about specific potential impacts the internet may have on student research reveals mixed views about technology’s effects. On one hand, virtually all teachers surveyed (99%) agree to some extent with the notion that the internet “enables students to find and use resources that would otherwise not be available to them.” This includes fully three-quarters (76%) who “strongly agree” this is the case. A majority (65%) also agree with the idea that the internet “makes students more self-sufficient researchers who are less reliant on adult help,” though only a small portion “strongly agree” with this statement (18%). While majorities of these teachers see the internet broadening available sources to students and encouraging their self-reliance, 76% of teachers also “strongly agree” with the notion that “search engines have conditioned students to expect to be able to find information quickly and easily.” Another 23% “somewhat agree” with this statement, indicating it rings true to at least some degree with virtually all of the teachers surveyed (99%). Looking at how subgroups of our sample responded to these items, some interesting differences emerge. Teachers in rural areas are particularly likely when compared with teachers in other types of communities to “strongly agree” that the internet allows students to find more resources than would otherwise be available (82% “strongly agree”). Teachers whose students live in households with incomes below the poverty line are particularly likely to agree that the internet allows students to be more self-sufficient researchers (25% “strongly agree”). The table below shows which subgroups of these AP and writing teachers are particularly likely (or particularly unlikely) to “strongly agree” with each item. In a separate survey question, AP and NWP teachers noted additional positive influences they see the internet and other digital tools having on student learning. 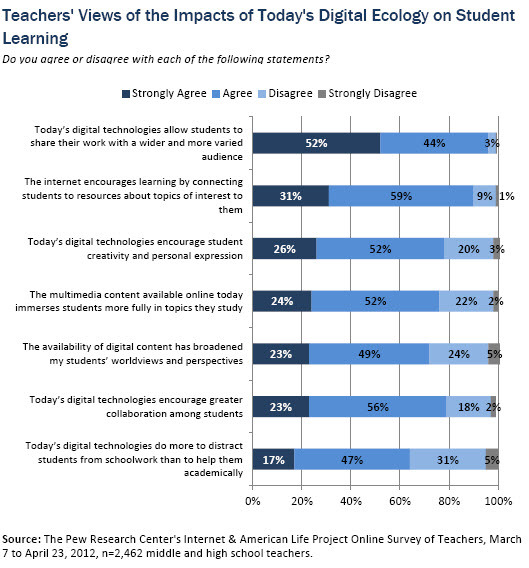 A majority of teachers “somewhat agree” or “strongly agree” that the internet and digital technologies encourage learning by connecting students to more resources about topics that interest them (31% “strongly agree,” 59% “somewhat agree”), enabling them to access multimedia content (24% “strongly agree,” 52% “somewhat agree”), and broadening their worldviews (23% “strongly agree” and 49% “somewhat agree”). Teachers’ perceptions of these impacts vary, particularly across grade level, the socioeconomic status of students, and the subject matter they teach. Middle school teachers (teaching 6th-8th grade) and those whose students live in the lowest income households are particularly likely to “strongly agree” that the internet connects students to topics that interest them, that multimedia online content immerses their students more deeply in those topics, and that overall, the internet helps expand their students’ worldview. Math and science teachers, in contrast, are the least likely to see these impacts. The survey posed two open-ended questions asking this group of AP and NWP teachers to reflect on what they see as the “most positive” and “most negative” aspects of students being able to conduct research online. Teachers’ coded responses are represented in the graphics below, with the size of each word reflecting how frequently it was mentioned by respondents. Each graphic is accompanied by some examples of teacher responses to these questions. The former question asking for the “most positive” aspect of online research elicited many comments about the openness and accessibility of online information. The latter questions asking about the “most negative” aspect drew mainly responses concerning the ease of copying and pasting information and concerns about students’ ability to judge the quality of online information. Students have quick access to some of the best available research online, especially if they have access to databases and are taught how to use them to do research. Also, when students do come across information they don’t understand in the course of research, the internet allows them to conduct quick, tangential searches to learn needed information in support of their primary search. The near infinite possibilities for information retrieval makes for animated research! Students are WILLING to research online because things are easier to find with search engines. Researching with books, journals, etc, is more tedious and time-consuming. Students are not willing to put in that kind of time and effort. It is instant gratification. Visuals usually accompany the research. Easy accessibility to a variety of sources and access to things like museums or archeological sites worldwide they would most likely not be able to travel to on their own. Students can use the world-wide-web as the best library ever built and as the largest public forum. They can read articles of every opinion and often discuss those opinions on the same page. In a rural county such as I teach in, access to information from the internet is essential. Without it, my students would be way behind suburban school districts. Information is immediately available to them and they don’t have to go anywhere physically to obtain it. In my area of foreign languages, they are able to access foreign newspapers, magazines, blogs, etc. and it is in real time and authentic language. This is a huge improvement over the past when we had to wait for authentic materials to come in the mail – or bring them back from Europe. If students have access to the internet and will take the time to do the research it lessens the gap, in other words all students have equal access to the information and it is portable. Same as the positive! They have access to a seemingly endless amount of information, and they can get to it quickly. They don’t know how to filter out bad information, and they are so used to getting information quickly, that when they can’t find what they are looking for immediately, they quit. It becomes the sole method for gaining information. Even direct observation skills whither because everything is viewed on-screen. Information becomes something to be received from someone else. Cheating is so similar to doing online research that it becomes easily justified. Why does a student need to engage in learning if it is easier, faster, and more fun to play with a phone? 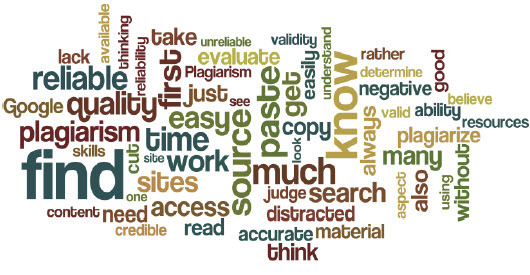 Plagiarism has increased, and the ability to search for the answers online instead of learning how to complete the problems or assignment using their own abilities. Students cut and paste without reading or evaluating the information. Speed is their objective, not quality. Students have difficulty sorting through all the information that they access. Because of the opportunities for leading the student to other subjects I think that students many times become diverted to other topics and have difficulty staying focused on the current work. Also students have trouble with documentation of the sources of their information. Students have become more lazy about research, relying on the first selection of sources, rather than digging deeper into subject matter. The speed at which they can find information. I have students that do not want to open a textbook set in front of them because it is “too much work” they would rather take out their phone and Google. They click on the first Google link that comes up. They rarely look farther down, or at subsequent pages. They don’t judge the quality of the info they find. They have lost the ability to do any non-internet based research. They can find information quickly and independently but they do not have the evaluative skills to determine if the information is accurate, they do not have the patience or determination to check the information with an alternate source (second opinion) and when we spend time in class using the internet to do research, they assume once they’ve found a site, they can print and be “done” when in reality they should print and read, think, analyze, and reassess whether they will need more or different information. Students also have a very hard time reading on-line for extended periods of time. They get distracted so easily with the computer screen as opposed to salient, extended reading in books/texts. Inability to use a library – digital or otherwise. My school district does not come close to supplying students with the digital technologies, or, more importantly, the district does not support them in any way in learning about how to judge the reliability of sources, how to maintain a responsible online presence, how to work with different content online, etc. The students are basically on their own. As a result, I see students using unreliable sources and I also see a gap between students who have access to the internet at home and those who do not. The focus groups presented teachers an opportunity to talk in more depth about the impacts they see the internet having on their students’ research practices. Among the benefits of these technologies, focus group participants noted how the internet provides students with much greater volume, depth and breadth of information than was accessible to prior generations. Several teachers pointed out that not only is more information available, but it is also available in many different formats, which can be extremely beneficial for students with different learning styles and even cognitive abilities. Moreover, many see the combination of text and images on the internet “bringing to life” the subjects their students are interested in, in ways that prior generations did not experience. Focus group participants also noted how they see the internet making the research process for students easier and more accessible because students are generally familiar with finding information online in their daily lives and do not find research assignments as mysterious, daunting, or difficult. The hope expressed by some teachers is that these tools make “doing research” more palatable and even enjoyable for today’s students, fighting what some see as potential apathy in this area. Many teachers also suggested that because the internet is “open 24 hours a day,” it is much easier for students to fit research assignments into their busy schedules. Because it is possible to conduct research from virtually any location at any time, given the right device and internet accessibility, learning is now a 24-hour process that students can engage in whenever they wish to. Students may accept the veracity of online information too easily. A pressing concern for these middle and high school teachers is some students’ tendency to accept the first information they find through online searches without verifying that the information is accurate or reliable. A core concern in every focus group was that online information is often inaccurate and biased, and that middle and high school students do not have the skills necessary to identify the most credible information. A major challenge teachers cited in teaching effective research skills is getting their students to look beyond the first link in the search result list and to “dig” for high-quality, reliable, and accurate resources. Some teachers noted a perception among some students that “because it’s on the Internet, it’s right.” Moreover, a common litmus test used by students to confirm the truthfulness of information is finding the same information in several different places online; both teachers and students acknowledged in focus groups that this is a commonly used strategy among students. Today’s students are not skilled enough at thinking critically about or synthesizing the information they find online. Many teachers expressed the idea that today’s relatively “easy” online research process can result in fewer original thoughts, less critical thinking, and not as much actual synthesis of information on the part of their students. They point out that students can—and sometimes do—copy and paste information they find online directly into documents, without adequately thinking about it. This not only raises obvious concerns about their understanding of concepts such as plagiarism and fair use, but also worries some teachers that students are not developing adequate ability to think critically about the information they find and what it means vis a vis other information. Students are becoming too reliant on the internet in lieu of other valuable sources of information. Focus group participants repeatedly voiced concern that the internet, rather than being one of many research tools students rely on, is becoming the only tool some students use. While many teachers said that online search engines are a good starting point for student research, they would also like to see their students utilize more effectively other resources such as library databases, books, and journals. Some expressed the concern that students may be losing the ability and/or inclination to use sources other than search engines, which may be better suited to the particular topic or question they are researching. Several focus group participants suggested that some students are so reliant on the internet and search engines that when these tools are not available, or information cannot be found easily online, they are at a loss about where to look next. Further, in the experience of these teachers, some students work from the assumption that any information they need can be found online, quickly and easily. If information the student needs does not appear on the first page of search results, they see some students stop looking for appropriate material out of frustration, use less suitable information that is more readily available, or assume that the information does not actually exist. Thus, while on the whole teachers acknowledged the benefits of a broad base of information being quickly available via the internet, many also said they would prefer to see tools like Google used as only one of many different types of sources. Conducting research online can present too many distractions for students, preventing them from fully focusing on the task at hand. In focus group discussions, some teachers expressed concerns that when students conduct research online, they often are engaged in many other activities at the same time, such as using social networking sites, watching online videos, playing online games, etc. This online “multi-tasking” may interfere with a student’s focus on an academic task, and may also be impacting time management skills. Some teachers in the study report that students do not always set aside adequate time to complete assignments, specifically because they believe that digital tools will allow them to complete the task quickly online. However, when they do go online, students can be pulled into so many competing activities that the time they have allotted is not sufficient. Teachers say this is particularly true when a student leaves an assignment until the last minute, to find that online searches produce either too much information to sift through in the time available or too little information and inadequate time to research it more deeply. In focus groups, students confirmed this is sometimes the case. As one student explained, she has had the experience of going online to do schoolwork and then “suddenly realizing” many hours have gone by and she has spent most of that time on a social networking site—without remembering what led her there. The volume of information online can be overwhelming for some students, and students often do not have time to winnow through it. Many teachers say they have watched their students become overwhelmed by the sheer amount of information available online and either a lack of time or a lack of ability to sort through it effectively to find the best information for the assignment they are working on. Teens are not alone in this feeling; prior Pew Internet surveys indicate that 70% of adults agree with the assertion that “the amount of news and information available from different sources today is overwhelming.”7 The teachers we spoke with acknowledged that they too often feel this way, and are not surprised that students can become easily overwhelmed. Yet some are concerned that when students feel inundated with information, some respond by using the first information they come across without knowing if it is the best information available. Pew Internet has tracked the impact of cell phones on all Americans, adults and teens, since 2001. Over that time, as cell phones have become “smartphones,” people have become more and more reliant on these devices as information gathering tools. Specifically, cell phones have provided users with the ability to get almost any information they need at almost any time in almost any location. Among adult cell phone users, the reliance on these mobile devices for “just-in-time” information is steadily growing. A March 2012 survey of U.S. adults finds that 70% of all adult cell phone owners had used the device in the past month to get a needed piece of information—including 35% who had used their phone to solve an unexpected problem and 27% who used their phone to settle an argument they were having. Other uses included getting help in an emergency situation and getting real-time everyday information such as weather or sports scores. Overall, these “just-in-time” adult cell users comprised 62% of the entire U.S. adult population.8 It is not surprising, therefore, to see adolescents and teens using their mobile devices as information-gathering tools, both inside and outside of the classroom. To probe how these devices are being used by teens in their academic work, teachers were asked whether and how cell phones have become part of the learning experience. 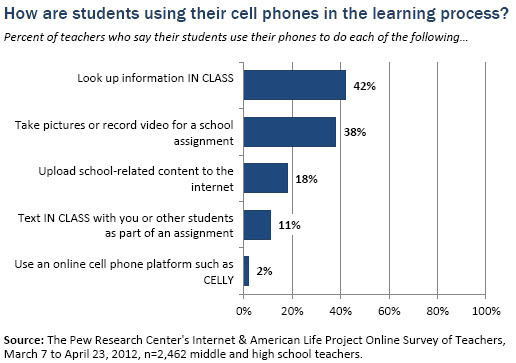 Roughly half of the teachers surveyed report that students are not permitted to use cell phones in their classrooms. The remaining half spoke to the impact these devices are having. The survey asked teachers whether their students use cell phones for any of five specific learning-related functions, shown in the table below. Reflecting the growing role of mobile tools in providing instant access to information, the most popular among the five activities asked about is students using a cell phone “to look up information in class,” cited by 42% of the teachers who participated in the survey. This was followed closely by students using mobile phones to “take pictures or record video to use in class assignments” (38%). In focus groups, teachers noted how these tools can spur excitement and learning. Several teachers gave examples of students using phones to look up in class something of particular interest to them, rather than having to wait to look it up later. The teachers felt this fostered excitement for learning and capitalized on the student’s interest in that moment. While some teachers noted that cell phones can be distractions in the classroom, they also expressed the belief that cell phones are “here to stay” and present an opportunity to connect with their students using devices the students are excited about. The impact of cell phones is being felt less by teachers in rural areas. Just 28% of this group says that students use phones to look up information in class, and fully 64% report students are not permitted to have cell phones in class. In contrast, 52% of teachers who describe their students as mostly upper and upper-middle income say students use their phones in class to find information. The grade level and subject matter taught also impact how phones are used in class. Among 6th-8th grade teachers, just 23% say students are using phones in class to look things up, compared with 43% of 9th-10th grade teachers and 49% of those teaching 11th-12th grade. Likewise, while 49% of history/social studies teachers and 45% of English teachers see students use their phones this way in class, the same is true of just 24% of math teachers and 36% of science teachers.